The whole gym is used for this 90 minute class, so ideal for those that have been used to just one hour sessions. It’s also a great class for absolute beginners too, as the skill base is grass roots of the sport. Children are placed into groups of up to 8 and sent off with their coaches to the apparatus which includes a 10 metre fast bouncy track onto a sponge landing area. Trampette, Vault, Sprung carpeted floor, 5 Balance beams and 2 bar stations and rope climbing are some of the other challenges also touched on. The children may wear shorts and tee shirt or leotard for this class. Children are taught all aspects of gymnastic moves from a forward role to a backwards walkover. Walking forward and backwards on the high beam and learning to jumps and forward rolls on the beam as well. On the bars they are taught to hold shapes from a hanging position and are also taught to pull up to front support and swing backwards around the bar, all with support from the coaches. 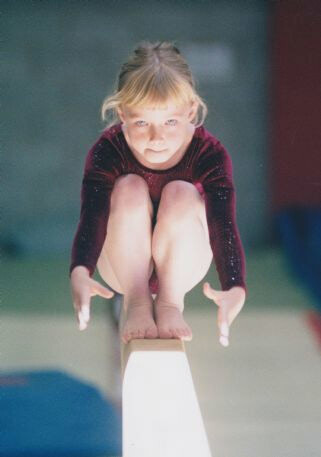 Fast track – they are taught the basics of rebound and the gymnastic shapes needed in the air. The same kind of thing is taught using the trampette. The ropes are always an area the children like to play at, and we try to encourage them to climb the ropes. The coaches show them the way to go up and how to slowly come down. Floor work includes forward rolls, handstands, Cartwheels and walkovers. Vault is often used as are vault stations, which basically is a smaller set up in case they find the actual vaulting table too difficult. All in all this is a cracking class and one that any child that is keen on gymnastics, will absolutely love. Classes operate throughout school holidays. Arabian has a viewing window that you are welcome to watch your child from. For this class, the blind is up for the last 30mins of the session.